Political committees concerned with marijuana law reform in four states have waged an information war over the past year, first to qualify cannabis initiatives for the ballot, and then to support or oppose those measures in the lead-up to last week’s midterm elections. In total, over $12.9 million in cash and in-kind services was spent attempting to convince voters about these marijuana ballot measures. Now that voters have had their say, Marijuana Moment decided to calculate how much each “yes” and “no” vote cost the committees on either side of the debate. Our calculations are based on dollars raised and disclosed before the election, since final totals of actual expenditures won’t be available until December or January reports required in the states that voted on cannabis. In Michigan, where voters approved marijuana legalization, our calculations show that the two anti-legalization committees spent about $1.28 per “no” vote, as they raised $2.37 million for the 1.85 million votes against the measure. The proponents spent 19 percent more per vote, or $1.52 for each of 2.35 million “yes” votes. In Missouri, three separate medical cannabis initiatives competed in the run-up to Election Day, resulting in the highest funding levels of the four states we looked at. There, committees raised a total of $5.4 million dollars to influence voters. Across all the committees, the average cost per “yes” vote was $1.82. Amendment 3, which was supported by Find the Cures PAC, spent $2.91 for each of its 747,977 votes. Proposition C, supported by Missourians for Patient Care, spent $1.44 for each of its 1.03 million votes. New Approach Missouri, which supported winning Amendment 2, which garnered the support of 1.57 million voters, spent the least, at $1.10 per vote. Only Amendment 2 received a majority and was approved. Given that there were three competing measures on the ballot, vote costs cannot be parsed in the same binary “yes” or “no” on marijuana reform that is possible for initiatives in the other states. A “no” vote for one measure in Missouri was often paired with a “yes” vote for another. 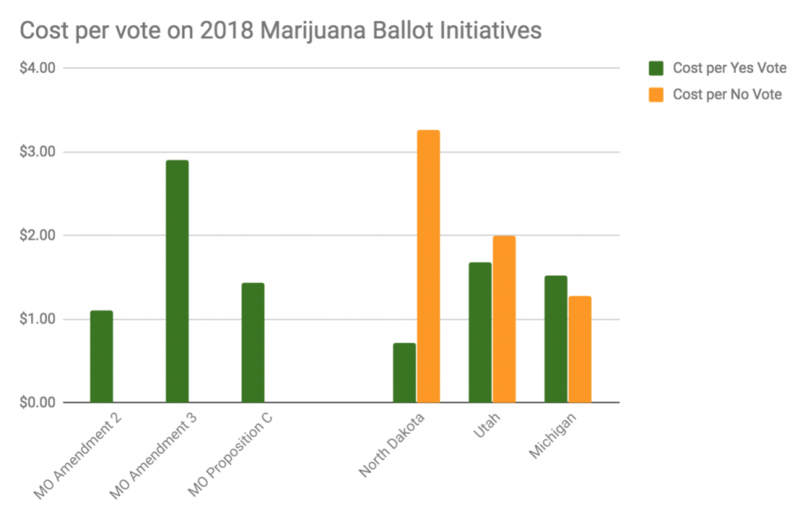 In North Dakota, there were many fewer votes cast on the state’s marijuana legalization initiative as compared to cannabis measure elsewhere, a total of 324,550. The two committees that opposed Measure 3 heavily outspent the pro-reform committees, to the tune of $629,648 to $94,308. With 131,585 people voting for the initiative, the cost per “yes” vote was 72 cents. On the opposing side, winning came at a high price: Each “no” vote cost four and a half times as much, or $3.26, the most costly per-vote expense on a marijuana ballot measure in the nation this year. In Utah, a relatively state where proponents of medical cannabis measure Proposition 2 were narrowly outspent by opponents, the cost per vote was higher. Votes are still being counted more than a week after Election Day, but preliminary vote totals show opponents spent $908,464, or $1.99 for each of the 455,879 votes against the initiative. The prevailing “yes” committees spent $831,471 for 493,060 votes, or $1.69 each. About 8 percent of precincts are yet to be counted, so both of these figures will decrease as more votes are added to both the support and opposition tallies. Overall in the three states that had a straight up-or-down vote (Michigan, Utah and North Dakota), the average cost per “no” vote was slightly more than each “yes” vote, with prohibitionist committees spending an average of $1.56 for each “no” vote, versus $1.51 spent on average for each “yes” votes. It should be noted that those costs include millions of dollars in in-kind services. In Michigan, for example, The Coalition to Regulate Cannabis like Alcohol reported $706,900 in in-kind services, or 23 percent of their total fundraising. Looked at another way, the average per state cost (rather than total votes average) for “yes” votes was $1.31 while “no” votes cost 67 percent more: $2.18. And with the total number of “yes” votes in those states outnumbering “no” votes by 19 percent, it would seem that in the state-by-state marijuana legalization battle, you don’t always get what you pay for.